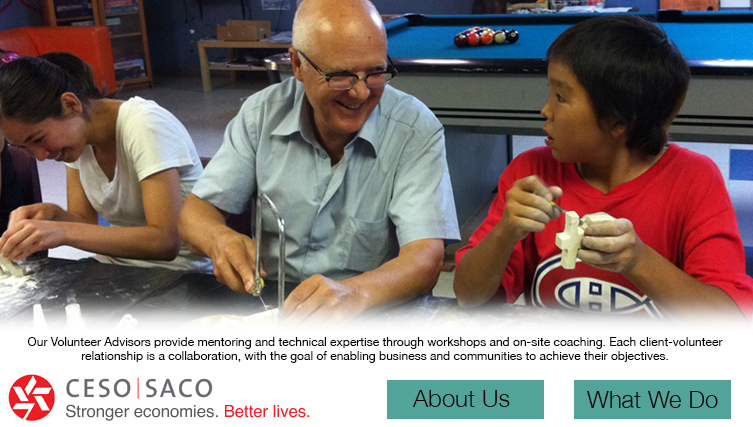 CESO is one of Canada’s leading volunteer-based development organizations. Since 1967, through partnership and the dedication of our volunteers who are highly skilled and experienced in their professions, we have completed more than 46,000 assignments focused on improving the economic and social well-being of peoples across Canada and in more than 120 countries. We have partnered with organizations representing Aboriginal Peoples in Canada and with international communities and organizations around the world. We are a team of committed volunteers and staff who believe deeply in the power of partnership to foster economic health and stability. 10/02/2009 Attention CESO Aboriginal clients: We Want Your Feedback! This partner currently has no jobs. This partner currently has no events. This partner currently has no tenders.